Memorial Day’s in the rearview mirror, which means it’s time to fire up the grill, don your summer whites—and break out the Pimm’s No. 1. This herbal, spice-infused liqueur is huge in the UK, where the fruit-topped Pimm’s Cup is a classic English summertime-afternoon, playing-croquet-on-the-lawn sort of drink. James Pimm invented the original Pimm’s (and gave it the highly original name of Pimm’s No. 1) in London in the 1840s, combining gin with a distinctive blend of herbs, fruits and more. In further years, he followed it up with Scotch-based Pimm’s No. 2, brandy-based Pimm’s No. 3 and so on. Today, most of the others have been discontinued and it’s just the No. 1 you’re likely to see. It’s low-proof enough (25 percent ABV) to make for a great all-day sipper, particularly mixed with lemonade or ginger ale, à la the classic Pimm’s Cup. But our fascinating friend Pimm’s can be plenty versatile, too. Here are three ways to serve it this summer. If you go to the local pub in Wherever-Shire and order a Pimm’s Cup, most likely you’ll just get Pimm’s with lemonade or perhaps ginger ale. We prefer the latter, for its bit of ginger kick, making for a simple, straightforward way to appreciate the spicy, herbal flavors of Pimm’s. It’s dead-easy to make at home—and just as easy to make by the pitcher. Instructions: In a glass with ice, mix 2 ounces of Pimm’s and 4 ounces of ginger ale. Garnish with a cucumber slice. When most people think of Pimm’s, they think of that single cocktail. 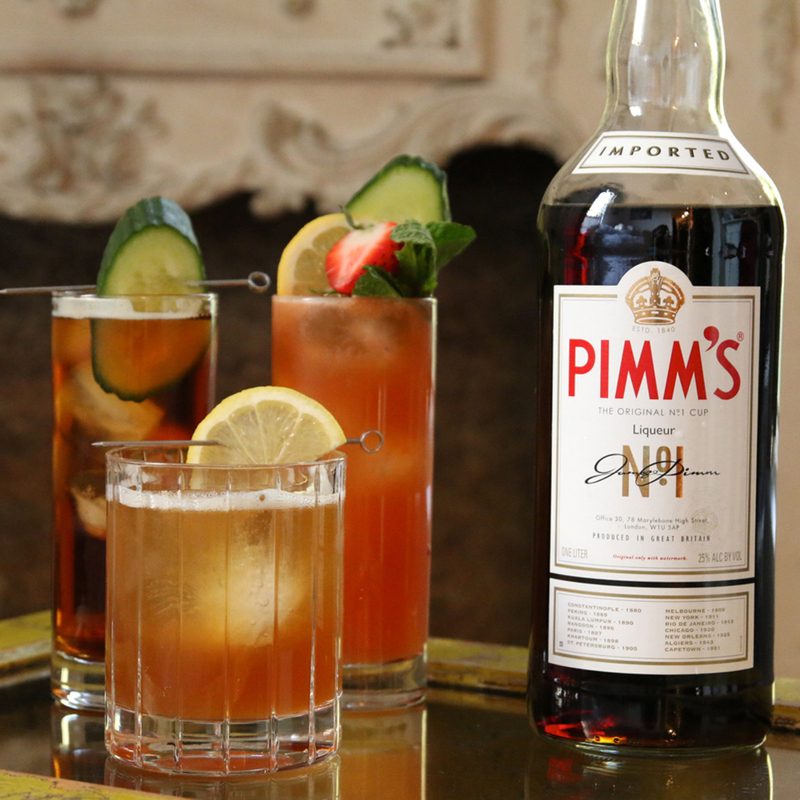 But we find that all of its interesting herbal and spicy notes make Pimm’s an excellent addition to other drinks. Here, the spice of good rye makes a perfect match, with lemon and a touch of sugar to brighten it up. Consider this your ideal summer evening cocktail after a day’s worth of Pimm’s Cups. Instructions: To a cocktail shaker with ice, add 1 ounce of Pimm’s, 1 ounce of rye (we like High West Rendezvous rye), ¾ ounce of freshly squeezed lemon juice and ¾ ounce of simple syrup (equal parts sugar dissolved in hot water). Shake it all up, strain over fresh ice and garnish with a lemon wedge). We already taught you the basics of the Pimm’s Cup. But there’s a lot of room for improvement. It’s a cocktail that’s tons of fun to garnish—you’ll often see them with strawberries or cucumbers on top—but we think it’s even better with all of those ingredients muddled right in, along with some lemon to brighten it up. Instead of ginger ale, use the sharper ginger beer and fresh muddled ginger. With a little pop of gin, and a fruit-basket garnish on top, it’s a serious crowd-pleaser. Instructions: In a cocktail shaker, muddle—that is, smash up—a slice of ginger (about the size of one finger knuckle, ¼ inch thick), 1 cucumber slice and half a strawberry. Add 3 mint leaves, 1 ounce of Pimm’s, 1 ounce of gin (we’re using London’s classic Beefeater), ¼ ounce of freshly squeezed lemon juice, and ¼ ounce of simple syrup (equal parts sugar dissolved in hot water). Shake that all up, and fine-strain (pour through your cocktail strainer, then through a fine mesh strainer) into a glass with fresh ice. Top with 2 ounces of ginger beer. Garnish with another cucumber slice, half a strawberry and a lemon wheel.